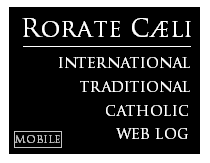 RORATE CÆLI: One is Simon, the other is Peter? - Gänswein: Papacy was changed in 2013 into an "expanded" Petrine Office with two members. - Does this confirm the Socci-Messori thesis of a papal diarchy? One is Simon, the other is Peter? 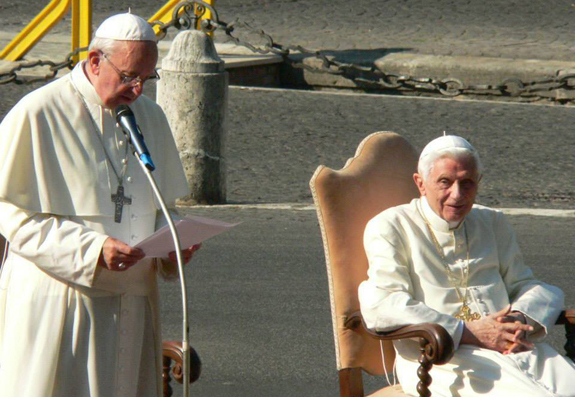 - Gänswein: Papacy was changed in 2013 into an "expanded" Petrine Office with two members. - Does this confirm the Socci-Messori thesis of a papal diarchy? Edward Pentin's latest column on National Catholic Register (Archbishop Gänswein: Benedict XVI Sees Resignation as Expanding Petrine Ministry) reports on a speech delivered by Archbishop Gänswein at the Pontifical Gregorian University, May 20. The speech, as reported by Pentin, has two topics of capital significance. From the viewpoint of "current events" perhaps the topic that will attract more attention is his reference to the election of Benedict XVI in 2005 as the outcome of the battle between two factions of Cardinals: the infamous "St. Gallen" group of liberal Cardinals who wanted to prevent Ratzinger from ascending to the papacy and the "Salt of the Earth" group of conservative Cardinals who supported him. Surely our regular readers will remember the furor last year when the machinations of the St. Gallen "mafia" was first revealed in a biography of Cardinal Danneels -- see our posts about it (St. Gallen Mafia) as well as the Pentin's detailed interview about the 2005 conclave with Paul Badde. From a theological and dogmatic point of view however, more attention is warranted by Gänswein's comments on the transformation of the very office of the Papacy after February 11, 2013, his claim that the resignation of Benedict XVI was of a different character compared to previous papal resignations, and his assertion that there are "not two popes", but one yet expanded Petrine Ministry with Francis and Benedict both as members -- one active, the other contemplative. It is all too easy to dismiss Gänswein's comments as merely his personal opinion, if not for the fact that in addition to being a doctor of Canon Law and a former official of the CDF he is, above all, the secretary and daily companion of Benedict XVI himself. Surely we can take his interpretation of Benedict's resignation as a faithful reflection of the latter's own thinking. "Two Popes": Has the Papacy become a Diarchy? We beseech all of our readers to read the above post, which now assumes tremendous importance. In a speech reflecting on Pope Benedict XVI’s pontificate, Archbishop Georg Gänswein has confirmed the existence of a group who fought against Benedict’s election in 2005, but stressed that "Vatileaks" or other issues had "little or nothing" to do with his resignation in 2013. Archbishop Gänswein, who doubles as the personal secretary of the Pope Emeritus and prefect of the Pontifical Household, said Benedict did not abandon the papacy like Pope Celestine V in the 13th century but rather sought to continue his Petrine Office in a more appropriate way given his frailty. 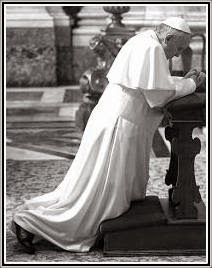 “The election was certainly the outcome of a battle,” Gänswein went on, adding that the “key” to the Conclave was Cardinal Ratzinger’s “dictatorship of relativism” homily that he gave on the first day of the election when he was Dean of the College of Cardinals. Drawing on the Latin words “munus petrinum” — “Petrine ministry” — Gänswein pointed out the word “munus” has many meanings such as “service, duty, guide or gift”. He said that “before and after his resignation” Benedict has viewed his task as “participation in such a ‘Petrine ministry’. Archbishop Gänswein point out that the motto is not in the singular but in the plural, and taken from the Third Letter of John, in which it is written in verse 8: "We must welcome these people to become co-workers for the truth". Archbishop Gänswein repeated that Benedict’s resignation was “quite different” to that of Pope Celestine V.